White Castle's brilliant pulled pork sandwich ad. One of my all-time favorite TV commercials is for White Castle's pulled pork sandwich. It's a little creepy, and a little inappropriate, but I think it's hilarious. I assume that was intentional, unlike my next example of White Castle-themed entertainment. Last year a law went into effect in New York City that requires restaurants with more than 15 outlets to post calorie information for the items they sell. Chain restaurants fought the law - and lost. So now New Yorkers can clearly see the number of calories they are about to consume. The law even applies to items that are so clearly unhealthy - like Wendy's Baconator - that putting a calorie count next to them appears to be done solely for the amusement of people who would never consider eating them. 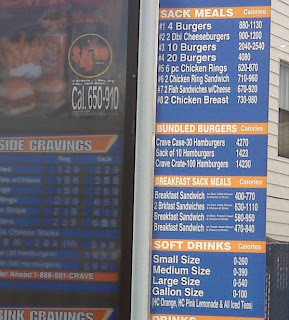 Calorie-wise, White Castle's food is not any worse than any other chain restaurant's. But White Castle almost certainly has a lock on having the highest calorie item available in a chain restaurant in New York City. I'm not talking about Sack Meal #4, featuring 20 burgers, though I'd bet that few restaurants have anything that would be a worthy challenger to Sack Meal #4's 4080 calories. Sack Meal #4 does deserve special recognition for being a pre-configured meal option that includes 20 burgers. Most chains don't even offer a multi-sandwich combination. Nor am I talking about the gallon-size drink that is available. That is listed at 100 calories, which has to be a mistake. I'm going to assume that a gallon of soda has 1000 calories. That's a lot of calories in a drink, but there are numerous items on White Castle's menu that exceed 1000 calories. However, just like Sack Meal #4, this menu item deserves recognition for being significantly larger than similar items offered by White Castle's competition. I'm talking about the 14,230 calorie Crave Crate. Sure, unlike Sack Meal #4, it's not an item that a single person could possibly eat. But it is a single menu item, and as such, its calories must be listed. I'm not sure that even 14,000 calories would deter me, honestly. In case I can't finish them all, though, how long do you think those things keep in the fridge? You are in a uniquely powerful position to conduct just such an experiment on Friday. Please!!! For a guy that only weighs about 118 pounds (and that's with Tabby on your lap)...Why are you so damn worried about calories! You need to eat a few WC burgers now in hopes that you won't pass out again from hunger.